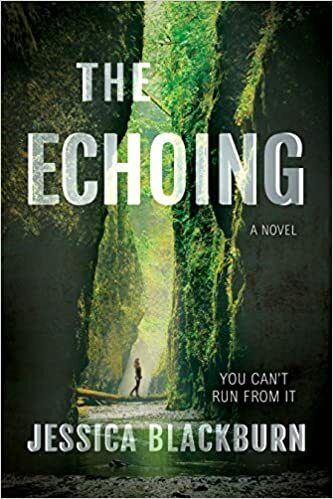 Novel-ties: In the Steps: Blog Tour for Jessica Blackburn's "The Echoing"
In the Steps: Blog Tour for Jessica Blackburn's "The Echoing"
I'm excited for the next two days. I have back-to-back reviews of books that really captivated me. Tomorrow, I'll be reviewing a very different type of book, but right now, I'd like to introduce you to this semi-morality-taleish novel that I got to read with a very interested heart. Rylee is a teenager in Stevenson, OR. One day, she meets a blind witch in a cottage and is given the power of balancing. She now becomes something like walking karma. A man changes her tire and wins the lottery the next day. A bully spills his soda all over the principal. This is a power that can be used for immense good and consequently immense evil. When it turns out that someone is trying to manipulate her power for the latter, things get complicated. There, that's as unspoilered as I can make it. Like I said, it's semi-morality-taleish. It becomes less semi- when you read the prologue and it starts by talking about the imbalance caused by Adam and Eve sinning against God and ends with a verse familiar to everyone who ever set foot in Early Morning Seminary: "Adam fell that man night be and men are that they might have joy." Even with that Sunday School lesson as a prologue, I don't have a problem with this being sent to a broader audience. Having a working knowledge of holy writ would help at two points, but the author lays it out for those who might not be so inclined and I like that. Where the book has some challenges for me involves the number of subplots. It's 200 pages, 100 full pages shorter than my debut novel, and tells a lot more side stories than mine did. There's a family illness, a burgeoning romance, a friend's struggles to finance her college education, a relationship with her younger brother... And that's ancillary to "Holy crap. I just got my friend a grant interview because she shared her french fries with me!" Don't get me wrong. I want to hear about all of those things. But in more pages. The strongest threads are the family-based ones, not the social ones. This isn't just because of the morality tale element. It's a function of how strong the story-telling is. To put it more simply, the school antics never kicked me in the feels the way her closeness to her mother did. Thanks for the chance to read this thought-provoking book, Jessica and Cedar Fort! The characters are remarkably engaging with one exception. With 2 Nephi 2:25 at the end of the prologue, I was prepared to give Jessica props for having an effective LDS main character. (I've seen some horrendous examples in my many years of getting books from family.) Instead, that's the sassy best friend Shyler and my only beef with characterization is that Shyler is a very token Mormon to this story. Her faith isn't moving the plot forward and it doesn't play a role in Rylee's understanding of her gift, even when it's revealed that this is not a new kind of magic. (It's almost Narniaesque.) In Chapter 6, Shyler stays behind to argue about Mormons and polygamy with a teacher. In Chapter 9, she refuses to like a boy because he says that Mormons aren't CHRISTIANS! Late in the book, Rylee even wishes that Shyler were in on a conversation so she could explain everything using what she'd learned in early morning seminary. I have no problem with Mormon characters. I've written a few myself, most memorably when I wrote the missionaries meeting the Twilight vampires during tracting. But if Shyler were a Jewish character, she'd be listed as campaigning for kosher options in the cafeteria and arguing with the history teacher about him referring to the Shoah as the Holocaust. Rylee would refer to something she heard at Rylee's bat mitzvah. With all the wonderful things this book does, everything leading up to Shyler yelling "REMEMBER WHO YOU ARE! CHOOSE THE RIGHT! PROTECT YOUR VIRTUE!" on page 124 is heavy-handed depiction that almost comes across as a caricature. Going back to Shyler's alternate religious identity, she might as well have had her sign off her phone call with "Oy vey! Next year in Jerusalem!" There were other ways to accomplish the effect of a Mormon friend in this book. I was that kind of person in high school. My US History teacher gave me a copy of the textbook that he would be using to discuss the Mormon church and I returned it to him with pages of notes on doctrinal inaccuracies. When I was in my choir interview, I was asked my favorite verse of scripture and I quoted both Deuteronomy 4:29-31 and Doctrine and Covenants 78:18. Friends came to me with questions about Mormon doctrine ranging from "How true is the story about Mormon cannibals in Sherlock Holmes?" to "Does your brother smell now that he can't change his holy underwear?" When a person introduced his topic at Chapel as "How to deal with Satanists, cultists and Mormons," I took the time where we sang before his devotional to let him know there were Mormons in the audience (My sister and I) and we would be answering anything he said when people asked us about it. Why did I do all of that? Because I was the second Mormon to graduate from my school in its history. Because I went to Lexington Christian Academy knowing that this was a place for me to do recitation of the Gospel of John for my monologues class. Because my first role in a play at that school was as Elizabeth the mother of John the Baptist and Liza, an anti-abortion protester. Because I knew that people would misunderstand my Christianity as the school taught it. With a few exceptions, they treated me very well for my actual and obvious faith. I know someone who, after reading lots of internet stories about cons, expressed her eagerness for some fat loser at Salt Lake City Comic Con to tell her she's not a REAL fan and for her to prove that she is because she knows much more about ___________ fandom than they do. She's not the only one who talks like this. The thing is, nothing happens the way it sounds on the internet. In all my years as a fangirl, I've been mistreated once and it was because I told Sir Patrick Stewart that I was a domestic violence survivor who wanted to thank him for his charitable work. I feel like Shyler was written as a "This must be how every Mormon is treated for DARING to have faith!" while in most high schools, religious differences really don't come up on this kind of level. There is a time and a place for that kind of character and it wasn't as a background character. She took up more space in the energy of the book than the main character and that balance is what threw me.